Chaos and Nonlinear Signal Processing is a seminar course that investigates recent research in temporal data mining. We will study methods for finding hidden structures in time series. These hidden structures are found using techniques such as phase space reconstruction, clustering, neural networks, and genetic algorithms. Once discovered these structures are useful for solving system classification problems and for predicting events in time series. Example application areas include motor diagnostics, heart arrhythmia classification, speech recognition, and financial time series prediction. In addition to the topics mentioned above, this course discusses machine learning, time series analysis, adaptive signal processing, wavelets, and nonlinear dynamics. Be able to explain and apply the constituent technologies that form the TSDM framework. Be able to explain and apply basic wavelet techniques for analyzing time series data. Be able to explain and apply basic autoregressive integrative moving average (ARIMA) techniques for analyzing time series data. Be able to provide a definition of chaos. Be able to describe the differences between chaotic and stochastic systems. Be able to define data mining and explain at least one of the techniques used for data mining. Be able to explain a simple genetic algorithm. Be able to apply a simple genetic algorithm to a search problem. Be able to explain the basic concepts of Markov models. Be able to explain and apply the key TSDM concepts of events, temporal patterns, event characterization function, temporal pattern cluster, time-delay embedding, phase space, augmented phase space, objective function, and optimization. Be able to explain and apply phase space reconstruction techniques. Be able to choose appropriate time delays for phase space reconstruction. Be able to choose appropriate embedding dimensions for phase space reconstruction. Be able to explain the basic concept of the follow chaos modelling and forecasting techniques: linear and nonlinear filters, Markov models, neural networks. Be able to explain in detail one of the following: chaos and nonlinear dynamics, evolutionary computation, Markov models, neural networks, or some other appropriate topic related to this course. Be able critique others presentations. Be able to use the internet as a resource for research including newsgroups and appropriate webpages. Be able to write a conference level paper. Be able to find appropriate conferences and journals for publishing your work. Be able to conduct independent research in the TSDM area. 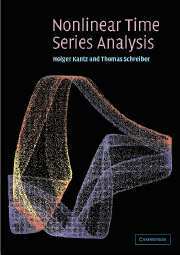 Nonlinear Time Series Analysis, 2nd Edition by Holger Kantz and Thomas Schreiber, Cambridge University Press, 2003. To achieve an A in this class your conference paper must be of the caliber to be accepted by an appropriate conference. Every A caliber paper will be submitted to a conference with the instructor and the student's advisor as a coauthors. You should expect to spend, on average, from twelve (12) to fifteen (15) hours on article reviews, critiques, reading, homeworks, and other preparation for this class. This time is in addition to the three (3) hours of lecture you are expected to attend every week. There will be ten (10) article reviews. This will help you understand the relevant literature for your research project. You will identify articles that are relevant to the course topic, if you are unsure of its relevance double check with the instructor. For each article you will write a 1 page summary and a 1 page critique. There will be one (1) research projects. This will be an original research effort culminating in a conference quality paper and associated presentation. You will be expected to propose, execute, write up, and present independent and original research. There will be no exams for this course.